​​AC Milan will host AS Roma in a ​Serie A clash at the San Siro on Friday, with I Rossoneri hoping to chalk up their first win (and indeed their first points) of the 2018/19 season in their first home match of the campaign. Gennaro Gattuso's side flattered to deceive last season, embarking on a ten-match unbeaten run before succumbing 3-1 to eventual Scudetto winners ​Juventus. Milan never quite recovered from this humbling defeat, finishing in a disappointing sixth place. Roma, on the other hand, reached the semi-finals of the ​UEFA Champions League, eliminating ​Barcelona in the process, as well as qualifying for this season's Champions League by finishing third in the Serie A table. I Giallorossi have also made a decent start to this season, earning four points from two league matches. However, Milan may well prove to be a more challenging proposition for Eusebio Di Francesco's side than either Torino or Atalanta. Unlike Roma, Milan have played just one league match so far this season, ​losing 3-2 to last season's Serie A runners-up ​SSC Napoli at the Stadio San Paolo last Saturday. There is no shame in losing to a side of Napoli's calibre, especially seeing as Milan gave a highly impressive performance in many respects. 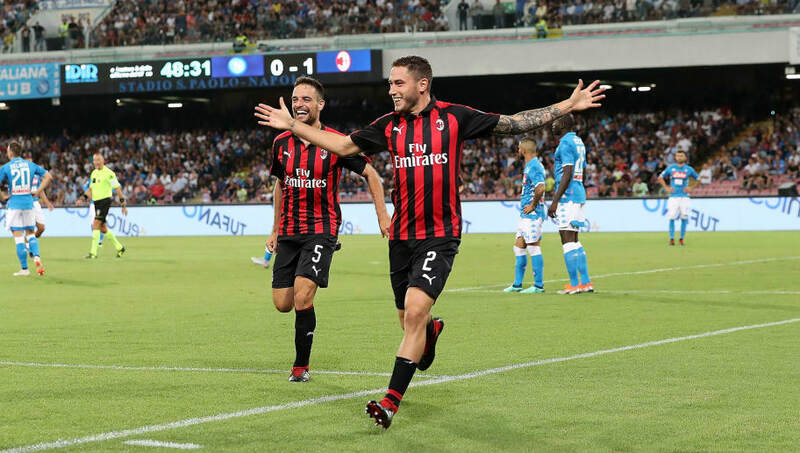 Nevertheless, Gattuso's men may still be kicking themselves after failing to defend a two-goal lead - although their defeat owed more to Napoli's brilliance than their own shortcomings. Roma won their Serie A opener 1-0 at Torino, before being held to a 3-3 draw at home by Atalanta on Monday. The home fans at the Stadio Olimpico were left stunned, as Atalanta raced into a 3-1 lead in the first half. Only a late Kostas Manolas equaliser spared Roma's blushes. Both Milan and Roma evidently have room for improvement as far as their defending is concerned. Milan will be without full back Ivan Strinic, who played in six of Croatia's seven matches at the FIFA World Cup in Russia this summer. The 31-year-old former Napoli and Sampdoria star has been diagnosed with a heart condition. This must be a bitter blow to the Croat, who only signed for Milan this summer. He is not expected to feature for his new club until December at the earliest. Meanwhile, Roma have lost one of their key players, as Netherlands midfielder Kevin Strootman has now joined Marseille. Di Francesco will also have to do without right back Alessandro Florenzi, who has been ruled out with a knee injury. In addition, Argentinian winger Diego Perotti is still recovering from a sprained ankle, so he may not be available on Friday. Milan (4-3-3): Donnarumma; Calabria, Musacchio, Romagnoli, Rodriguez; Kessie, Biglia, Bonaventura; Suso, Higuain, Borini. Roma (4-3-3): Olsen; Karsdorp, Manolas, Fazio, Kolarov; Cristante, De Rossi, Pellegrini; Under, Dzeko, Pastore. This fixture has seen many feisty and entertaining clashes over the years - none more so than Roma's dramatic 3-2 win at the San Siro towards the end of the 2008/09 season. Former Liverpool full back John Arne Riise opened the scoring for the visitors with a stunning free kick in the first half, only for Massimo Ambrosini to equalise for Milan in the 75th minute. In the ensuing six minutes, Roma regained the lead through Jeremy Menez, before Ambrosini levelled again almost immediately. Unfortunately for the hosts, Francesco Totti scored Roma's third in the 85th minute. This time, Ambrosini was unable to save his side, as he was dismissed three minutes after Totti's strike. It hardly seemed a fitting result for Milan legend Paolo Maldini's final match at the San Siro. Sadly, a vocal minority of his club's fans also made it clear that they weren't sorry to see him go. Some of Milan's football in their defeat against Napoli was truly sublime. If they can reproduce that form on Friday, the visitors may struggle to contain them. In fact, if Roma defend as poorly against I Rossoneri as they did in the first half against Atalanta, they could be severely punished. Admittedly, I Giallorossi proved against Torino that they are capable of keeping a clean sheet away from home. Nevertheless, it would be remarkable if they achieved the same feat at the San Siro on Friday.